Efficiency and smooth driving are ensured through total respect of driving rules of conduct, regardless of the driven path. We do not recruit chauffeurs, we select them. Each driver must have obtained a Professional State Card acknowledged by the training organisation and delivered by the relevant French authorities. They all master French and English languages. However, if you require another language skills, we will do our utmost to satisfy your needs. 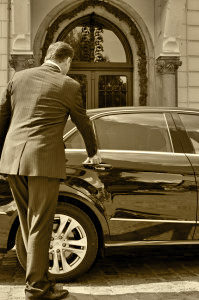 Punctual, courteous, adaptable and discrete, all chauffeurs have been trained by certified organisations. Moreover, they attend internal training and strict instructions are provided prior to each mission. During congresses, meetings and other regional manifestations, our chauffeurs are briefed in light of the overall mission logistic requirements and specific customers demands such as company logo display, flyer distribution, specific dress code or particular “meet & greet” procedures. Moreover, our chauffeurs all attend first aid medical training (PSC 1) once every two years. This training provided by official Health Organisation representatives has the objective to provide necessary competence to be more prepared and able to cope in an emergency situation through basic first aid gestures: provide security, mouth to mouth resuscitation, heart massage, use of defibrillator, etc. For AJM Touring, security and quality are of utmost importance.